Only in Paris for a few days? 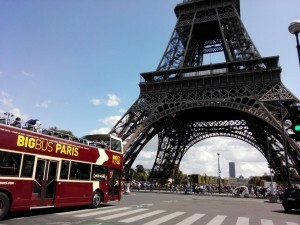 Then a bus tour around Paris is a great, effortless option to see a lot in no time at all. More than 10 different languages are spoken on board and you will have the opportunity to get pictures of famous landmarks and monuments during this unforgettable visit of the City of Lights! All of the city! You will be able to have a quick tour around the most important buildings and monuments in Paris: the Eiffel Tower, the Champs Elysées, Notre-Dame Cathedral, Montmartre neighborhood, and so much more. Thanks to headphones you are provided with, bus tours provide you with all of fun facts about these places while you are passing by each one. Several companies operate in this activity. While the cheapest ones might obviously be of lower quality, the 2 or 3 most commonly used are pretty much equivalent in terms of quality and prices. The main difference is that some companies offer various circuits, which allow you to switch from one loop to another and back, depending on the time you have available and on your interest for discovering less touristy neighbourhoods. If you are in a hurry, you should consider doing the standard bus tour without stopping which takes approximately 2 hours. But if you have more time, we recommend the Hop On/Off option. 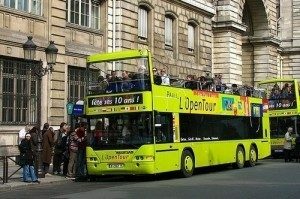 You can take the bus at more than 50 bus stations in Paris. When entering the bus, the driver will check your bus pass. 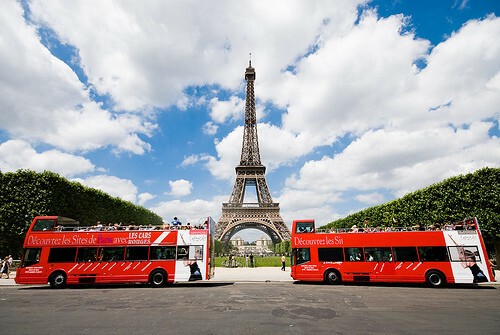 Once on board you will be able to admire the most important sights of Paris. Once you are on, you can “hop off” the bus whenever you like. Last but not least: if you want to do all of the loops and check every single neighbourhood of Paris, you have the option to get a ticket valid for 2 or 3 days.